The carryover of aflatoxin M1 into milk is a major concern in dairy production worldwide. Although the dairy cow rumen detoxifies a proportion of aflatoxin B1 in the diet, much is converted into aflatoxin M1. Aflatoxin M1 is the main contaminant in milk and poses the same threat to human health as food-borne aflatoxin B1. Management of the aflatoxin risk should begin with being selective regarding the source and storage of feed that the cows receive. Selecting the right mycotoxin binder is important because not all binders are effective or selective. If there is a problem with aflatoxin contamination on a dairy farm, a fundamental step is to identify the main source or sources of the toxin. Aflatoxin can contaminate many types of feed but is of particular concern in many oil-rich, high-risk crops such as peanuts, cottonseed and soybean. Cereals including corn and wheat can be affected, particularly if insect pests or drought stress damage the kernels. Certain regions carry a higher risk of aflatoxin contamination, especially those with warm, wet, tropical or subtropical climates. The complete feed should be tested for the presence of aflatoxin B1 and individual ingredients should be inspected for condition and obvious mold growth. Individual feed materials can be tested but a representative sample must be analyzed, achieved by combining several subsamples. Aflatoxins are usually very unevenly spread throughout a batch, being present at high levels in specific spots that may be missed in casual sampling. Tip 1: Regularly analyze feed ensuring that samples are representative of the whole batch. Because the Aspergillus species (such as A. flavus) that produce aflatoxin B1 are often storage fungi, an aflatoxin issue may commonly be related to sub-optimal storage conditions. Feed material should be as free from damage as possible, low in moisture content and without localized areas of moisture. Pockets of moisture may occur when feed comes into contact with concrete bases or when warm feed is added to metal vats, resulting in condensation around the edges. Forages such as hay or silage should be stored well with clean feed-out management to avoid loose material being exposed to the air for prolonged periods. Even the bestpreserved silage can succumb to Aspergillus molds after days of exposure to air. Slight exposure to moisture or a warm, humid climate is sufficient for the aflatoxin species to invade forage. And although compact moist silage is too anaerobic for those molds, exposure to air provides the oxygen required for growth and aflatoxin production. Tip 2: Avoid feeding noticeably moldy material and check that feed troughs and feed-out areas are regularly cleared. Mycotoxin binders are an effective tool against aflatoxin contamination. Selecting the right mycotoxin binder is important because not all binders are effective or selective. Effectiveness involves fast and strong binding. An effective binder is one that has been shown to bind a high proportion of aflatoxin B1 when there are high aflatoxin B1 levels and a low relative concentration of the binder in difficult pH conditions, for example pH 5.0. Specificity is important because some binders will reduce the availability of vitamins, veterinary medicines and antibiotics. Under high aflatoxin pressure, it may be necessary to increase the level of binder included at which point specificity becomes even more important. Tip 3: Choose a mycotoxin binder that is both effective and selective. 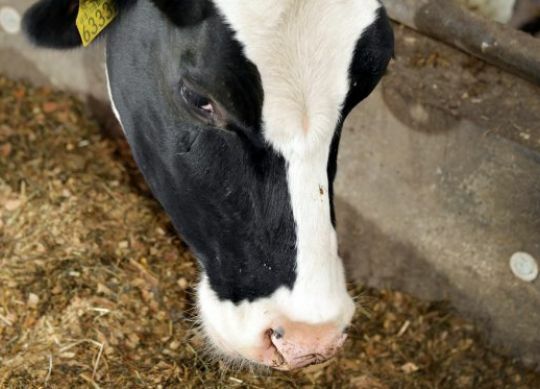 Aflatoxins are not the only mycotoxin that can impact dairy cow performance or milk quality. Deoxynivalenol, for instance, can affect milk production by compromising the intestinal barrier and the condition of the microbial community in the rumen. In turn, compromised microbial fermentation may reduce aflatoxin detoxification and a compromised barrier can allow a greater level of aflatoxin uptake. Effective management of aflatoxins and other common mycotoxins should therefore be broad, with effective and selective binding of aflatoxin and proven biotransformation of mycotoxins like deoxynivalenol that are not reliably bound. Tip 4: Consider the presence of other mycotoxins in the feed and implement the necessary mycotoxin mitigation strategies to ensure animal performance is not compromised.